Students in the 4s, 5s, and 6s explore the elements of creative dance and basic game structure. Gross and fine motor development is encouraged through running, jumping, galloping, skipping, as well as throwing, catching, kicking, and dribbling. Spatial awareness, bodily coordination and control, musicality, self-expression, and social cooperation are practiced through a variety of creative movement activities, group challenges, and games. Students learn to work together in space, navigating their own bodies safely while working with partners and in small groups. Movement expands in the upper grades from the basic elements of dance and sports to include the concepts of movement phrases, choreography, folk dance, and performance, as well as the more complicated game structures involved in soccer, volleyball, basketball, kickball, and games of the children’s own invention. Students begin thinking critically about how games work and how to participate in them in a way that feels safe, fun, inclusive, and challenging. These games increase endurance, strength, and more advanced ball skills. Upper grade students continue to learn how to navigate their own bodies safely through space while working energetically and rigorously. 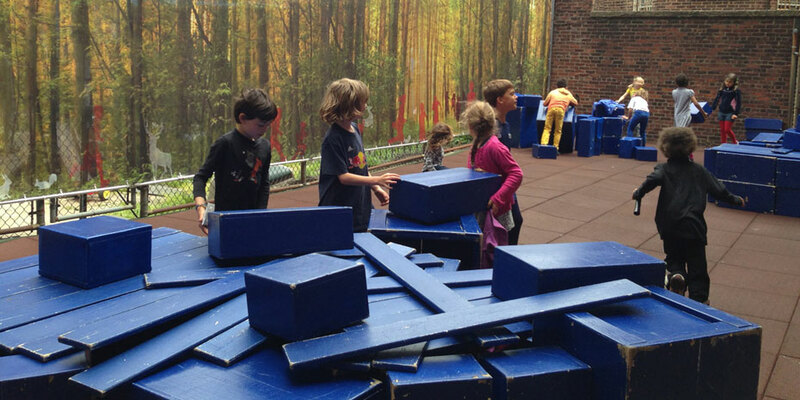 They practice managing their social-emotional responses to game play and cooperation. Daily life in the early childhood classrooms is full of creative arts experiences with a variety of open- ended materials. Children also participate in weekly visual arts classes with artists in the community on a trimester basis, allowing children the unique opportunity to work with a particular art medium for an extended period of time. Recent collaborations include classes in woodworking, ceramics, and painting. Students take weekly visual arts classes with artists in the community on a trimester basis, allowing children the unique opportunity to work with a particular art medium for an extended period of time. Recent collaborations include classes in woodworking, ceramics, painting and mural design. Returning to the same core materials from year to year provides children with the chance to extend their work even further. Additionally, visual arts work is integrated through- out daily life in the classroom. The core of music education for 4s, 5s, and 6s is about using voices, movement, and instruments. Students sing, clap, and play to the beat as they learn the basic patterns of making music together. Children are introduced to small hand-held percussion instruments like maracas, tambourines, triangles, claves, sticks, woodblocks, and bells. They sing songs and play games that develop skills like echoing movements and sounds, building rhythmic consistency, and cultivating memory for melody. Students explore music from the United States, Latin America, Europe, Africa, and Asia, and create songs of their own. 7s work with Orff mallet instruments: xylophones, metallophones and glockenspiels. They study the technical aspects of music: working with pitched instruments, reading rhythm notation, taking apart songs to create new patterns, and learning to sing in two parts: rounds and multi-part songs. 8s learn to play recorders, creating ensembles with voice and percussion, and learn to read melodic notation. The 9s and 10s combine the skills they have accumulated in ensemble music-making, incorporating recorder, percussion, voice, lyrics, improvisation, and composition. They are also introduced to a new instrument, typically guitar. At Greene Hill students learn that, while computers are important tools for research and communication, they are also tools for creativity, design, and bringing ideas to fruition. By engaging in self-initiated projects and open-ended experimentation, children learn how to solve problems in innovative ways. The technology program begins in the 7s, with one trimester of weekly instruction per year. 7s learn to use computers as tools for creativity and design. They start by taking apart a computer and acting out the ways in which the different components work together. They begin to learn simple algorithms by working with LOGO floor robots, and are then introduced to programming using Scratch. 8s and 9s continue to work with Scratch, developing their programming skills and learning about grids, debugging, object inter- action, conditionals, and sensing. They work on independent and group projects that integrate their programming skills in new ways. In the 10s, they extend their work by programming physical objects that respond to their commands. Trips are an important part of the curriculum at Greene Hill School, and help us fulfill our educational mission by connecting our students with the community and city. All of our lower school students go on trips throughout the year, from walking trips in the neighborhood around school to longer outings to various places around the city. Field trips both directly support the curriculum (for example: our 8s visiting Ellis Island as part of their study of immigration) and deepen the students’ learning and appreciation of life outside of school (for example, each class’s annual excursions to theatrical performances through our partnership with the New Victory Theatre). Our older students have an overnight trip experience each year, beginning in the 8s.